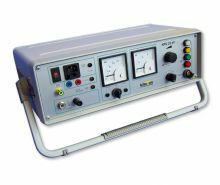 The Kilovolt Prueftechnik Chemnitz GmbH develops, manufactures and markets portable High Voltage Test Equipment. 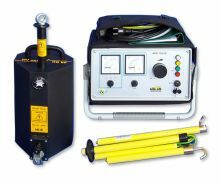 The main focus is on Cable Test Sets for insulation testing of Medium Voltage Power Cable Systems. For almost 2 years KILOVOLT Prueftechnik Chemnitz GmbH was looking for a new, bigger and seminal company location. Numerous industrial properties in the city and outskirts of Chemnitz were checked as new potential locations. Finally, in September 2017 an agreement was reached with the new owners of the business park "Gewerbepark Wirkbau" - the MIB Wirkbau Chemnitz GmbH & Co. KG. From October 2017 until January 2018 the construction work was in full swing. Modern and bright office rooms, a big conference and training room, a big production hall and warehouse and also a new big High Voltage Test Field were built. The new premises were fully equipped with high-efficiency glare-free LED lighting. Also investments into the IT infrastructure were made. From February 2018 the company move took place. This step was important for the further growth of KILOVOLT. Luckily we could move inside of our business park, this has significantly reduced the effort for the relocation. And fortunately, due to this our well know address and contact data remain unchanged. All of our employees have rapidly settled in. Our production is running again one hundred percent. In the course of relocation many processes were optimized. R&D, production, service and logistics are now perfectly linked. With the new company location KILOVOLT is well equipped for the future. 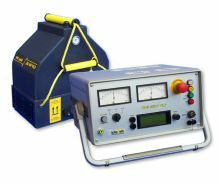 The brandnew KPG 54kV VLF presented by KILOVOLT Prueftechnik is the world's smallest and most compact test equipment for VLF cable testing up to 19/33kV cables according to the standards IEC 60502-2, DIN VDE 0276-620 & 621 and CENLEC HD 620 & 621. From 08/2016 a new generation of control for the VLF Test Sets is available. As of now new Digital Meters are optionally available for our DC Hipot Test Sets. On 29 July 2012 the Saxon Minister of Economics Mr. Sven Morlok visited the KILOVOLT Prueftechnik Chemnitz GmbH as part of his tour to small and medium-sized companies. The State Minister was accompanied by Prof. Dr. Andreas Schmalfuss, 3rd Vice President of the Saxon State Parliament and of Bernd Reinshagen, county manager of BVMW (Association of mid-sized business) Chemnitz. In an open round table the site conditions and the current economic development were discussed. Udo Neumann, managing director of the Neumann Elektrotechnik GmbH and Jan Haugke, managing director of the KILOVOLT Prueftechnik, explained to the visitors their successfully completed process of company succession, which was realized in year 2010. Then presented KILOVOLT´s managing director Jan Haugke to the Minister the production of the innovative High Voltage Test Equipment. Finally, with a small demonstration in the company's own test field, the visitors were infected by the fascination of high voltage.